It's the exam season again! As a website that designed to help students to excel in their academic, OnlineTuition.com.my has arranged a series FREE live lessons in October and November. 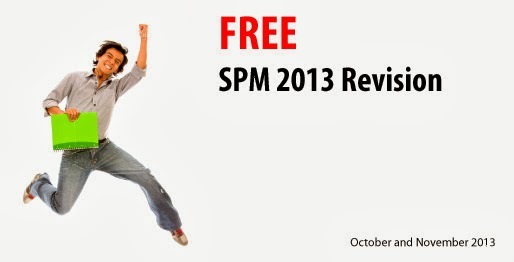 The aim of the FREE revision is to help students to prepare for the SPM exam which will start in November. No fee will be charged, no registration needed. Just click on the link provided to enter the classroom. The date of the upcoming lessons will be announced here and in our Facebook page. Topic of Discussion: SBP 2013 Physics Trial Exam Paper 3, Question 3. Note: Click here to download the note. Print it out if you have a printer because you may need to write some answer on the note. Topic of Discussion: SBP 2013 Chemistry Trial Exam Paper 3, Question 3. Below are the some of the slides of the discussion. Click on the image to enlarge. Topic of Discussion: SBP 2013 Physics Trial Exam Paper 3, Question 4. Topic of Discussion: SBP 2013 Physics Trial Exam Paper 2, Question 12. Topic of Discussion: SBP 2013 Chemistry Trial Exam Paper 3, Question 1.